How do the sizes match up from your GW figures vs. the ones from RN Estudio? They look like they'll make great "standouts" from the rest but I'm never sure about how scale actually lines up. What an incredible army & narrative thread! I've been following your updates for a long time and aspire to being also create on this level. Particularly impressive is the way you've created conflict within it but still managed to tie the force together. Your Darkwood Court has become one of my main places to look for inspiration & new ideas. Wanted to say thanks for sharing! Just wrapped up my questing knights. Their story is here and is part of the Malign Portents/Soul Wars narrative I'm working on. Eventually it'll tie into my main force. Take a look and let me know what you think! Some angles of the regular knights Shaman / Icon Bearer The leader of the group. I'm calling her The Verdant Knight I would love to hear your feedback. This is the first time I've tried NMM. I tried to use the technique for an interesting green-metal style. I also wanted to create a green glow off of certain weapons, runes, and armor. It turned out ok in terms of a color scheme link to Ghyran, but I've got quite a bit to learn still. As far as the models, most are kitbashes of Reaper and some GW parts. I can't take too much credit there - I did some green-stuffing and converting, but I found most of the riders at least partially connected to bears on Ebay a while back. Thanks for taking a look! Wrapped up a new unit for my main dispossessed army. Fluff can be found on the blog. I love these old ironbreaker sculpts. There's an ominous nature about them. I thought with a dark paint scheme they'd be perfect for my unit of scarred survivors from a battle with warpfire. The army colors are a pretty basic dwarf blue & white, so I used washes and inks to get a blue tinge to the darkened metal. The sculpts already lent themselves well to the idea of armor hiding the scarred figures who had survived encounters with warpfire. I needed some way to make the unit unique though, and felt that flaming runes would both fit the fluff I was imagining and contrast the rest of the models nicely. The unit champion is a Reaper model, but I think it fits pretty well still: And finally, the fluff starts to play with runcraft so I included a runesmith in order to emphasize the mystical nature of the unit: All comments, critique, and feedback welcome. Thanks for taking a look! I like the conversions with the masks significantly more than the original models. Your stellar paint job does't hurt either! I'm excited to see where you go with this mysterious/lurking/darker the faction. The dramatic contrast and bold colors really bring these models to life! The Tale of your Army! My army centers around a duardin king and his clan, the Karakigrom, as they attempt to resettle themselves in Chamon. The main storyline can be found here, as I introduce each unit in their throng. I'm fascinated with all the variability in AOS though, so I'm also exploring what less "traditional" duardin might look like coming from different realms. The first of these tangential storylines is centered on the Malign Portents (here). My goal is to tie the different storylines together as a way to unify various duardin factions and explore what a unified duardin society might look like in the mortal realms. This is already my favorite AOS release, and I'm a collector of an old WHFB order army just for the painting and hobby of it. It has been said before, but this shows that alongside the completely new AOS factions there's room to build of and expand old favorite. The idea of variety and lack of boundaries is what AOS seems to be all about. As a dwarf fan, I absolutely love goblins for all the ways they contrast my own army - they're the perfect nemesis! But what we saw in earlier releases had me worried that everything in AOS might go the way of overly-specific micro factions, which might be fine for order but doesn't fit the randomness of grots at all. This is instead a beautiful example of GW creating a framework around an idea and then opening up the possibilities for hobbiests to run wild with. I'm so excited to see where this release allows people to take their armies! OscarLars Painting Stuff - NURGLE! Some of my favorite nighthaunt paint jobs I've seen on here. The bright green really adds an unsettling element. Best part though is the incredible texture on the fabrics! Really like the war paint on the beast! Absolutely love this. The desire to pursue and destroy in whatever ways causes the biggest bangs, splats, and crunches is so visible in this ambitious creation. 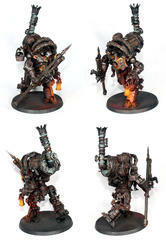 I can practically see swarms of grots watching it zoom by, oohing and ahhhing as they anticipate the coming collision! Great army so far! It's exciting to see an army being built on this scale. Definitely looking forward to seeing where you take it. Will you be writing up background for the units or orders?